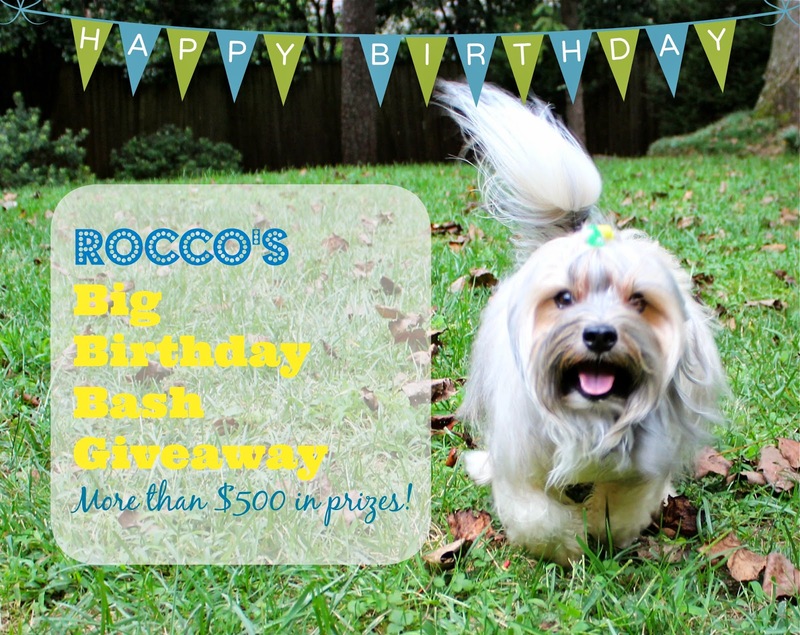 To Dog With Love: Rocco's Big Birthday Bash #Giveaway! More than $500 in prizes! Rocco's Big Birthday Bash #Giveaway! More than $500 in prizes! Today, Rocco turns two! And since he's had such a terrific year, he wants to give you all the chance to win one HUGE giveaway filled with some of his favorite things. I know the list is pretty long, but all the items here are things we love and we hope you love them too! We've got it all covered -- from hydration and fitness to toys, treats, chews and grooming. Huge thanks to PetSafe, DogTread, Paw it Forward, EarthBath, Petco, Zuke’s, Best Bully Sticks, The Company of Animals and Merrick for contributing the awesome products to Rocco's Big Birthday Bash prize pack! Here's a look at the amazing prize pack Rocco's assembled for his Big Birthday Bash Giveaway! One lucky winner will receive this entire haul… a $500+ value, filled with goodies you and your dog are sure to LOVE! Take a look at all these goodies and then enter via our giveaway widget at the bottom of this post! Most dogs and cats need about an ounce of fluid per pound of body weight per day. Here's a way to help keep them healthy and hydrated. We love our Avalon fountain in red! We love the Avalon Fountain from PetSafe. 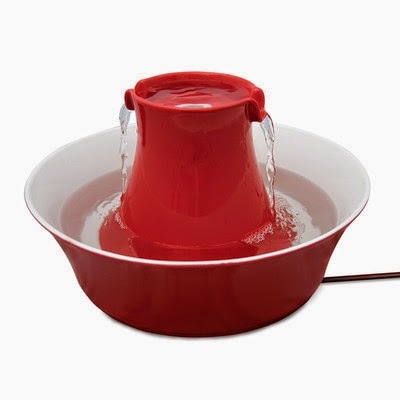 It comes in both red and white and continuously recirculates and filters your pet's water, keeping it cleaner and fresher the a normal water bowl. You can read our review of the fountain here. Play is one of the most important things you can do to build your bond with your pup, and besides, it's just plain fun! 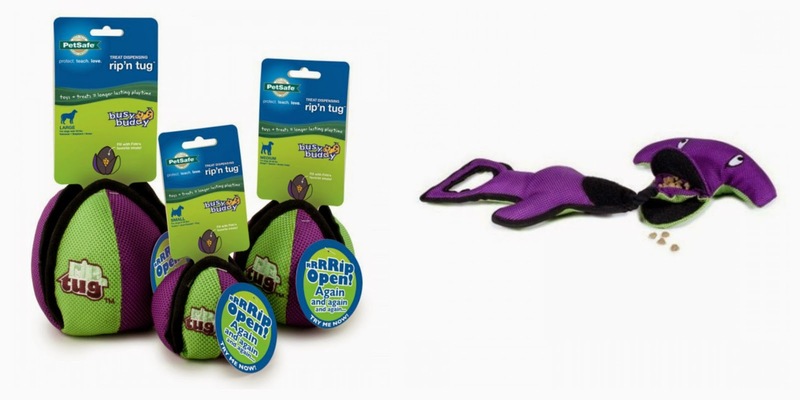 We love these interactive toys to help stimulate and enrich the life of your dog… and you too! We love Nina Ottosson toys at The Company of Animals for fun, interactive games you can play with your dog. The Dog Magic is a perfect way to start. It's relatively easy game for any dog to play, where they have to dislodge bones to access hidden treats. Treats can be placed under one, several, or all the bones to vary the difficulty. 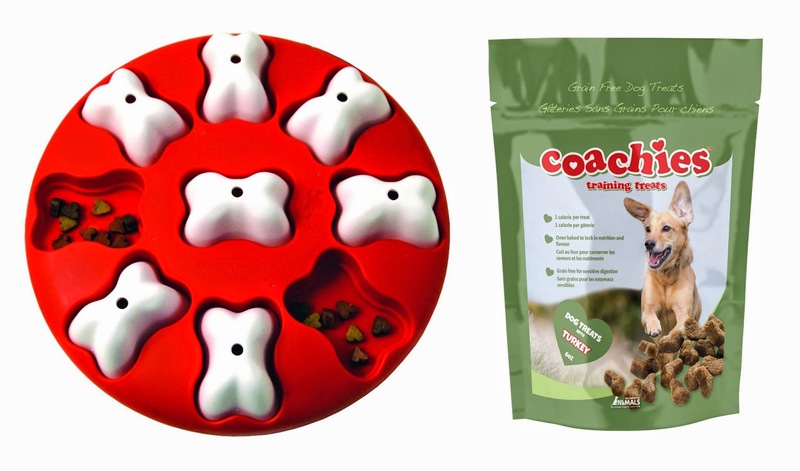 We're also including a bag of Coachies Training Treats from Company of Animals, a perfect pairing with the Dog Magic. We also love interactive toys that can be used for rewards, fetch and find it games! Two of our favorites are the Busy Buddy Rip 'n Tug Lotus and the Busy Buddy Rip 'n Tug Hammerhead Shark. The Lotus is perfect for rewarding your pup for a job well done! Fill the fabric pouch with your dog's favorite treats, close the fastener and use the toy as a fun reward. We like using it after an agility run or for throw and chase games! We've used the Hammerhead Shark for tugging, find it games and for attaching it at the end of a line for chase games. We stuff it with tasty treats or kibble and Rocco goes to town with it! The Rip 'n Tug Lotus and Hammerhead Shark are two of our favorite treat-stuffing toys! Rocco LOVES his Tennis Tail. 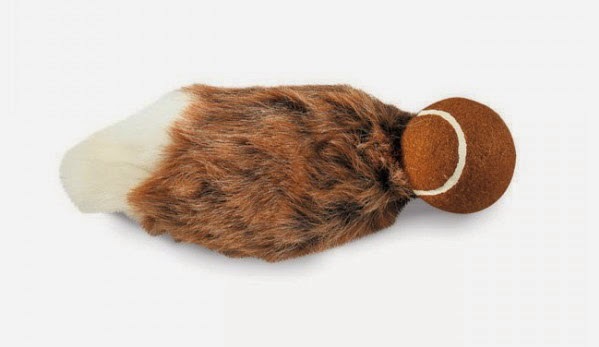 It's simply a Tennis ball and fuzzy squeaky toy all in one bundle of toss and fetch fun! He loves to chase it, bring it back and carry it around. Rocco's been busy building out his dog gym and one of his favorite pieces of equipment is the K9FITbone from DogTread. It's incredibly versatile… use it alone for balance and stability training or combine it with a second FITbone for even more challenges. It's a great way to build confidence and body awareness in younger pups too. Rocco has fun balancing on the K9FITBone and he likes to include it as part of an obstacle course too! And, if you're feeling adventurous, you can use it for yourself to do planks (rest your forearms on the bone) or for glute lifts (place your feet on the bone and raise your hips while engaging your abs and glute muscles). Grooming is not one of Rocco's favorite things, but Earthbath makes it easier by making a whole collection of wipes you can use between baths. 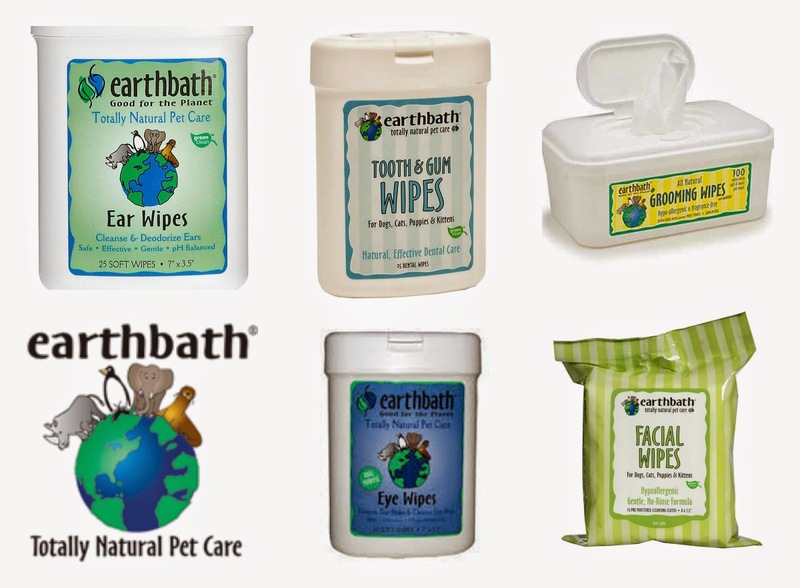 This entire collection of convenient Earthbath wipes are included in Rocco's Big Birthday Bash giveaway! I love using this variety of wipes for everyday grooming, and I also pack them in my bag for travel or for day trips. 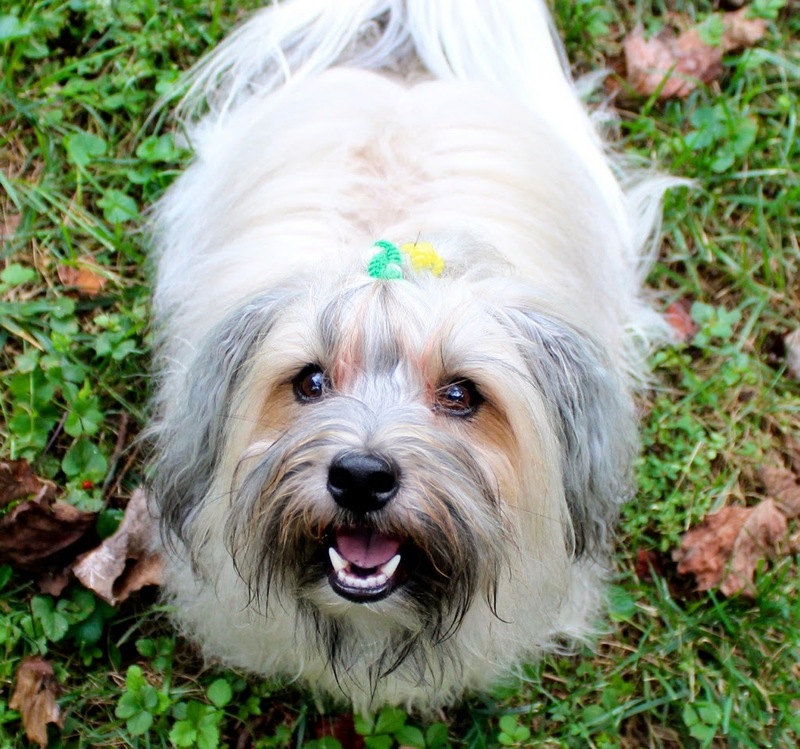 Even when we go hiking, I'll stash some grooming wipes in my bag for easy cleanup -- a necessity for a long-haired dog like Rocco! 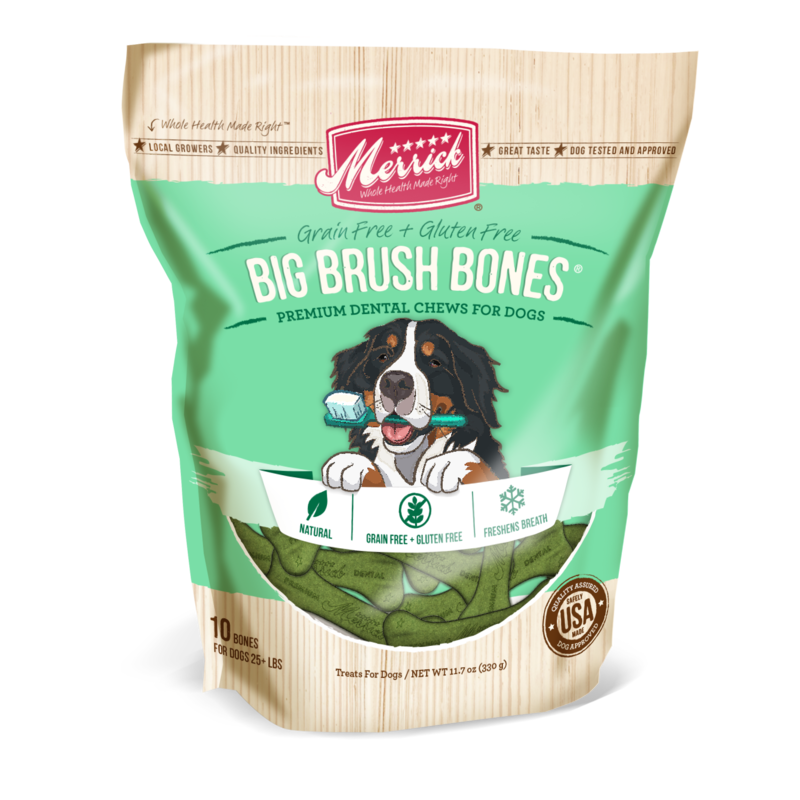 These smell fresh and clean and they are made with all natural ingredients like Hawaiian awapuhi extract, aloe vera and vitamin E.
Perhaps Rocco's favorite things in the world are his treats and chews. He's assembled a few of his favorites to add to his Big Birthday Bash prize pack. I've used Zuke's treats ever since I can remember. We love the healthy, natural ingredients and Rocco loves the taste. We're including three bags of Zuke's Supers and three bags of new Zuke's Genuine Jerky in our prize pack! You can read more about Rocco's love for Zuke's Genuine Jerky and Supers in these reviews. Rocco will do anything for Zuke's Supers and Genuine Jerky! 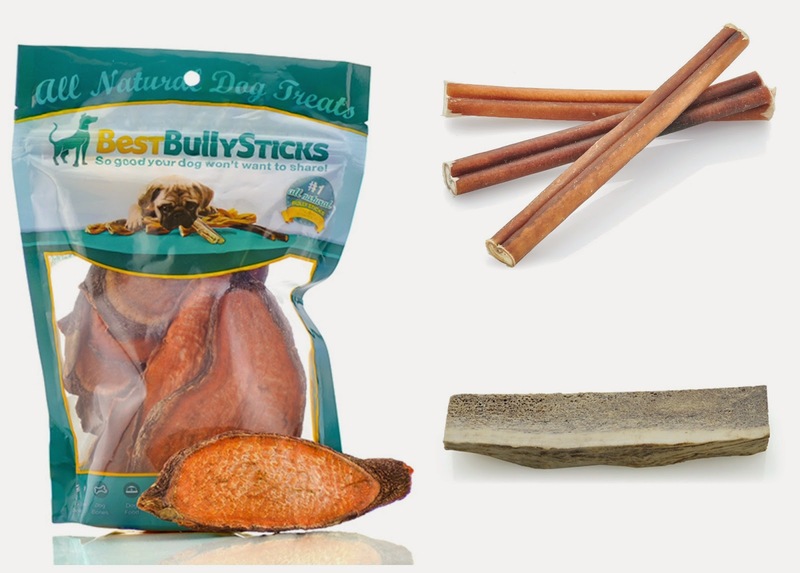 Take a look of Rocco's review of Best Bully Sticks products! Getting out for a dog walk and doing something good for others are two things that can help make you feel great. You'll get both from this adorable Paw It Forward matching set: collar, 6-foot leash and bandana. The Paw it Forward movement celebrates great dogs that are changing the world throughout their unconditional love, heroic actions and powerful inspiration. You can get involved by sharing great dog stories and by purchasing Paw It Forward merchandise, where 10 percent of all net profits support the specific causes of each individual dog or merchandise collection. Rocco wants to help make your pup a Paw It Forward Ambassadog by adding this cute set into his prize pack. Collar and leash are available in Green or Blue webbing, with reflective ribbon for night walking. You'll be able to choose a collar size in small, medium or large and a bandana size in x-small or one size fits all. You need something handy to store treats, poo bags, keys, your phone, clicker and a little cash. 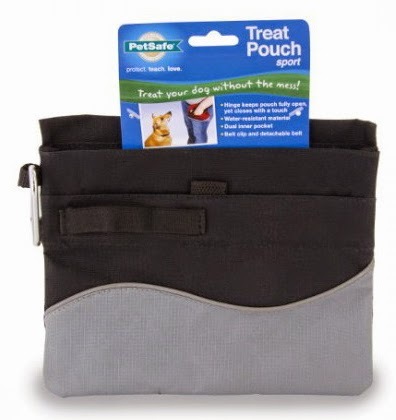 We love the Treat Pouch Sport from PetSafe. Everything fits in this nifty little pouch and you can either strap the adjustable/removable belt through your belt loops or just clip it onto your pants. We use the Treat Pouch Sport on all our walks! Rocco's including a $50 gift card to Petco in his Big Birthday Bash prize pack so that you and your pup can take a little shopping spree for anything we might have missed! While you're there, check out the Petco Halloween selection filled with cute costumes and toys and the fun Star Wars toys! 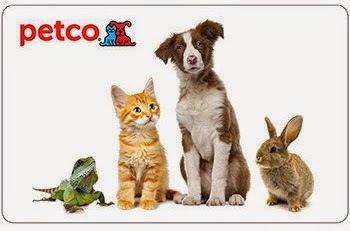 We can think of lots of things to buy with a $50 Petco gift card! Enter to win Rocco's Big Birthday Bash Giveaway! Value $500+! One lucky winner will walk away with this entire multi-brand haul, a $500+ value from the folks at PetSafe, DogTread, Paw it Forward, EarthBath, Petco, Zuke’s, Best Bully Sticks, The Company of Animals and Merrick! Keep it all for yourself or parcel out the items for all your doggie pals. You're sure to be the most popular dog in the neighborhood! Enter via the giveaway widget below. Enter as many or as few ways as you like. Just enter… or you won't have the chance to win! Special thanks to PetSafe, DogTread, Paw it Forward, EarthBath, Petco, Zuke’s, Best Bully Sticks, The Company of Animals and Merrick for providing the prizes for this giveaway. All prizes will be shipped separately from each participating brand. I see a lot of things I can use to train Mr. N! Cool and good luck to all. Have a terrific Tuesday. 7 rescued dogs here - we would love to win this Birthday Bash package!!! The K9FITbone from DogTread is really interesting and unique. Never seen anything like it. Our fur kids love Petco. It's a fun place to shop since the dogs get to choose their own goodies! Well happy 2nd birthday Rocco. Those are some wonderful things you have found to put in your giveaway. I love the variety of the prizes! There's truly something for everyone! If we win, we'll donate the prizes to our local animal shelter! Happy Birthday Rocco! This is a great Giveaway!!! Lola and Chopper would love all this stuff. I love the grooming products! Thank you for the chance! Wait a minute I almost forgot. Mr Spocks birthday is next week! Also his second! I love the grooming products! 3 dogs need lots of love! I like the treat pouch, it looks like a great training item. Oooh, everyone at agility class has rip and tug lotus balls except us! So we'd love one of those! First of all, Happy Birthday! We just had two birthdays at our house this past week. My daughter's kitten, Arata, is no longer a kitten as he turned one on the 9th and Moko, my sweet gray Tabby girl, turned 6 on the 12th. Aren't birthdays great? As for the giveaway......WOW! I love each and every item, but am especially hopeful of winning for the pet fountain. I really want one of those! Happy birthday Rocco! We enjoy your blog here at the Patton home :) Luma likes the looks of the water fountain! Fresh, clean water all the time, yum! Happy birthday, dude! Love seeing your blog--and looking forward to learning cool things from you and your mom! Happy Barkday Rocco! I can't believe you are 2 years old already! I still think of you as a little puppy :) I hope you have a pawsome barkday! I love the awesome variety of the prizes! I Love that Rocco gets his own big boy prize giveaway for all this friends! ;D Thats awesome!! Happy B-Day Mr. Man!!! Happy birthday, Rocco! To think that you're such an accomplished guy now, and I knew you when you were just a little guy! I love the drinking fountain and the doggie walking pack. Wow! Rocco is growing up so fast! Happy Birthday!! There are so many wonderful prizes!! I love everything, but I'm really excited about the Zuke's treats and the leash and collar. I love the blue and the green one. What a nice variety of prizes. I like the Bully Sticks. I love the variety! My favorite is the FITbone though!! There are so many great prizes in this giveaway. I love the interactive toy, and the bandanas and collars and I am looking for new grooming products those look good. OMG! That's a lot of great prizes! Happy Birthday Rocco! Love Dallas & Cody from Crunchkins WOOF! I love the bandanas and leashes. My 2 kids would look really snazzy walking with those. I love all the treats! I've got my eye on that $50 Petco GC. I love the Tennis Tail! Wow! What a great Birthday Bash! Happy Birthday Rocco! 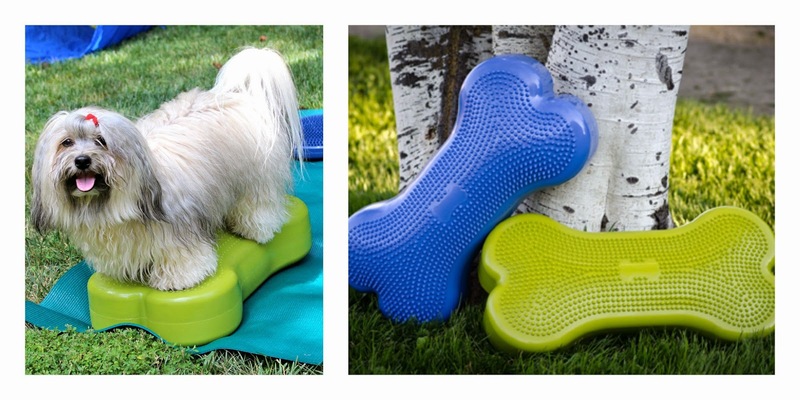 We love the variety, but the puzzle toy and the FitBone are our fav featured items. Happy Birthday to us! What a fabulous giveaway! my number one fave is the fit toys! lots of good treats and chews to boot! Happy Birthday Rocco - Litter mate to my Tulip! Awww, hi Tulip! Happy Birthday to you and Peso! We want to see pics! Happy, Happy, Happy Birthday Rocco!!! Wow Rocco! That is one big prize! Happy, happy second birthday to you! I sure hope you have a swell day filled with love, treats, and toys! I love all the prizes especially the Petco card. My Ozzy would love all of Rocco's giveaway goodies! Great Give Away. I have my paws crossed! Happy birthday Rocco!!! I love throwing my dog a birthday bash. Happy Birthday Rocco, and I hope you have many more happy ones. I love the wonderful variety in your prize giveaway. The dog tread is cool! I have never seen anything like that before! The water fountain is very pretty and my dog would love that, too. Its got everything a dog needs! Plus my babies deserve the best stuff! I love it all, but the K9FitBone sounds awesome! Everything in this prize package is so "paw some"! All of the dogs in Pup's pet therapy group would love to have a "pawty" to celebrate in your honor Rocco! PupDog and all his petting pals 🐶 🐾 Happy Birthday! My dogs love bully sticks. And I love my dogs. Happy Birthday Rocco! What an awesome prize pack :) I think the Avalon Fountain is really neat. I've been wanting to get one for my pups. Wow! What an incredible giveaway! Some of our favorites and some awesome things I've never seen before! Happy Barkday! I love everything about this prize package! My dogs are already gaga over anything Zuke's and they love interactive toys. I think the Dog Magic and Coachies would be a huge hit at my house. Happy Birthday! Those are a lot of great prizes! What fun! I love that there are so many products for my boys Ty and Oscar to try out!! I love the fountain and so would my Golden boy. i must say grooming items would be my favorites. I love all the great dog treats. I have five dogs and I know they would love the dog treats. Happy Birthday Rocco! What I love most is seeing your happy smiling face with the things you love the most. The Hammerhead Shark looks very interesting! Love it all and Happy Birthday to a great guy!!!! Everything but especially the water fountain and the K9 fitbone. Happy birthday, Rocco! I like the Petco gift card. I love the variety! That dog magic treat dispenser seems really cool! Happy Birthday, Rocco! I hope you get your own basket of goodies. The best part about this giveaway is the treats! I love the variety of useful items in the prize pack! :) Happy Birthday, Rocco! I love the diversity of the prizes- all sorts of goodies. I already use and love many of the products, and many more have been on my wishlist for quite a while! I want the avalon drinking fountain we need that so badly I pray I win. So sorry we're late to say HAPPY BIRTHDAY to Rocco!! Hope he had a great day, and what an awesome giveaway! The interactive toy and the treats is what I would love best to win for my doggies. Thanks! There are so many things my girls would love! I love all the different items and prizes! 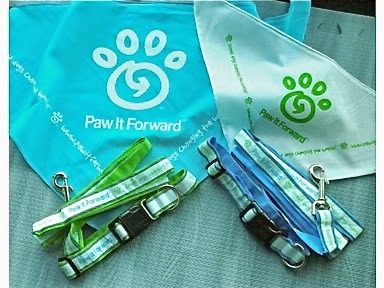 I like the Paw it Forward gear -- all the items are great! Happy birthday Rocco! Awesome giveaway. I think our favorite thing is the Avalon Fountain. We might have to buy ourselves one if we don't win the giveaway! Such cool pawrizes! We really like the Nina Ottosson puzzle! Something to keep my paws busy ( & out of trouble)! Happy belated birthday Rocco!! Hope it was very special :) Thanks for the pawsome giveaway! I love the treat stuffing toys and puzzle. My dogs would have fun with these. Happy Birthday Rocco! That's quite a prize pack! I have four furry dogs. I love the grooming items. Really want to win the K9 fit bone. I really want to work that into our fitness routine we just have not been able to afford one as of yet. Drago, my aussie, would love to win the bully sticks!! :-). The whole prize pack looks awesome to us. Crossing our fingers and paws for a win!! My dog would love the bully sticks!! Happy Birthday! The Avalon fountain would be great to have. Happy birthday Rocco. I would love the fountain for my elderly kitty sisters. I'm excited about the Pet o gift card. I really love the gift card, the variety is nice! Happy Birthday Rocco! All the prizes are fantastic! I love that not only are there wonderful things for Casey to enjoy, but plenty to share with the dogs of our homeless clients at the food bank when Casey and I work. I can't even begin to say how much my dogs would love to win this prize pack. I have eight dogs, three of which are rescues..... They would love this prize pack. I think I love the fountain and the k9fitbone the most. I know my Shelties would LOVE both of those items! They woild enjoy playing on that k9fitbone for sure and they love drinking from the stream of water when I'm pouring to fill thei bowl....so I know they would like a fountain. I've been thinking about getting them one.... And they love zukes everything.....any zukes treats I've bought they have loved! With most of my dogs being Shelties, they like interactive stuff to challenge them, so the interactive toy would be a huge hit too. We would use all of these things. I can't believe you've put together such an amazing birthday prize pack for someone to win! One of my Shelties just celebrated her 13th bday and I have another day coming up soon too.... I celebrate their doggie birthdays with a cake and presents so love seeing other dogs Bday celebrations. Loved all the pics of Rocco enjoying everything. Thanks for the Chance to win this really awesome prize. What I love is that I see several prizes Vix or her roommate Burton would love. Vix says have a woofing great birthday to Rocco. She's especially like the Avalon fountain. omg how can you choose! This would make for a great Christmas present for our fur babies Shelby and Frisco. Happy Birthday Rocco. I love the variety of items in the prize packs. Where to begin? This giveaway is auss-ome! The toys, the grooming products, the bully sticks, the treats... My aussies would love it all! OMGosh! I love it all though what we really need is a water fountain so we would be very excited about that. So great meeting you at the summit. I've posted about it today at www.catwisdom101.com. If I win. I'll donate the prize pack to the shelter I volunteer at. I think my lab and cane corso would like the Best Bully Sticks products the best. My username on Instagram is @angevege. Happy Birthday, Rocco! I love the variety of products! I like that it includes items to play with, grooming and hygiene items and treats! I love everything! Wow what a great birthday Rocco must have had!! I love the drinking fountain! My Polo would be the envy of all his furry friends with this great fresh water dispenser!! Thanks for the chance to spoil my dog!!! This is a great assortment of prizes for Roccos Big Birthday Bash giveaway. I actually have the PetSafe Treat Bag and it is very useful. I have been wanting to try Zuke's Natural treats so I love that they are included in this package. I love it all and they all seem wonderful for our new puppy, Lola. Happy Birthday Rocco! Happy Birthday Rocco, I like the grooming products for my two dogs, we could really use them. i really am excited about the package. my dog is my best friend and she deserves the best. Great giveaway. I would like to try the tooth and gum wipes. I love the variety of items included. The wipes would be helpful if you own an older dog! I think my dogs would get a kick out of the Dog Magic toys. I love that it has big brush bones. I like the grooming package! Happy Birthday Rocco. My pup has a birthday coming up also she will be one on December 28th 2014. I love the collar and leash. Happy Birthday, Rocco! Wow! What a celebration. I can't tell you what Jedi would love most -- toys or treats. Love the fountain and the puzzle most, but the whole collection is the best! I love that Rocco shares gifts with others on his birthday!!! My pugs would love any one, but the treats would be their favorite...pugs love to eat!!! Happy Happy Birthday, your party prize rocks. I would like to win the game puzzle, I've been meaning to get one for my gang. Have a great weekend. I definitely love all the different prizes being offered. I love the ear wipes as my female bully needs her ears wiped out often.